Are you interested in volunteering at the school and/or getting involved in the PTSO? PTSO supports SunRidge through special events for our staff such as Welcome Back Breakfast & Teacher Appreciation Week, providing Grants for Special Programs created by our teachers for our students, and the Guardian Angel program for those in our school community that may need additional aid. Please consider joining the PTSO. Forms are available here (you may pay by cash/check) print the form from the link below, fill out and drop off at the front office. Be in the know with the important dates, events, and activities happening at SunRidge! Please sign up to receive the eBLAST weekly newsletter through this link: http://eepurl.com/dEl0NX. We have a successful week this week at SRMS. Thank you for sending your students to school on time and ready to do their best on the FSA Writing test. Our students did a fantastic job of focusing and putting forth their best effort. Our first track meet was yesterday. Congratulations to both our girls and boys teams on a successful meet! What’s Happening This Week at SRMS? 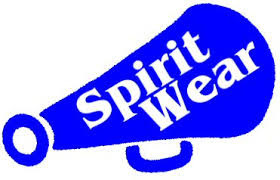 Monday, April 8th - West Orange HS spirit wear and 8th Grade dance tickets will be sold at 8th-grade lunch. Attention 8th grade parents - The 8th grade dance is this month! We would love to see all of our 8th graders dressed up and ready to celebrate their transition to high school. The PTSO is working hard to make this a memorable event for everyone. Tickets sales begin Monday, April 8th. Students must have a signed contract and their school ID to purchase a ticket. 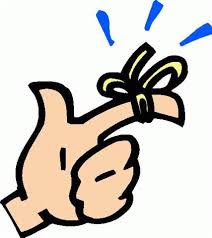 Contracts can be picked up from the front office or printed- 8th Grade Dance Contract.pdf . Tickets are $10 per person. 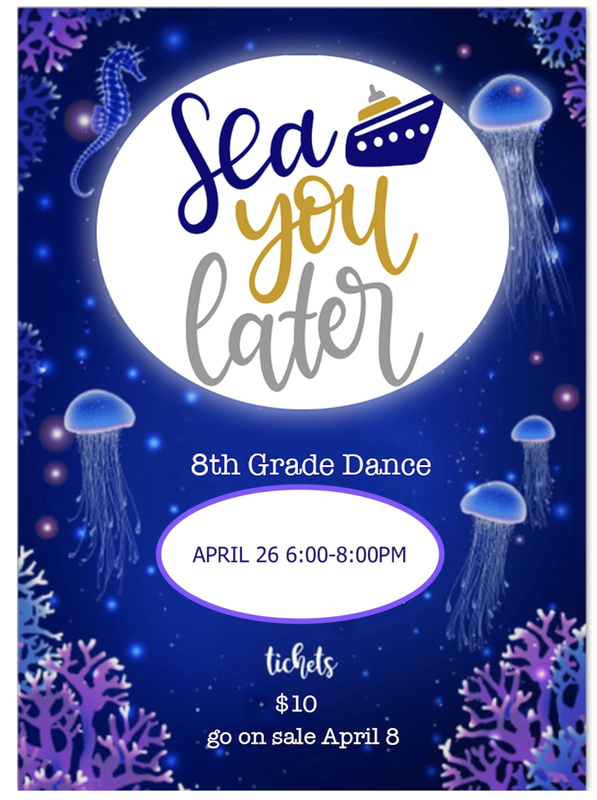 Come celebrate and say “Sea You Later” to middle school on Friday, April 26th from 6:00-8:00 pm. 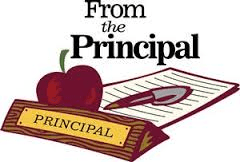 This week is Assistant Principal Appreciation Week! We are very lucky to have Mr. Foster and Mrs. Sarmiento on our team as our Assistant Principals. If you see them around remember to thank them or send them an email thanking them for all they do for our eagle family! As you are aware, state legislation has moved the majority of our testing back to May. That makes our testing window very tight. Please be sure to have the following dates on your calendar. If possible do not plan doctors appointments or trips during testing days. Thank you for your help in ensuring our students are here for regular testing days when possible. 5/16 - Begin Common Final Exam (CFE) testing. Final exam in any course that is not covered by state testing. 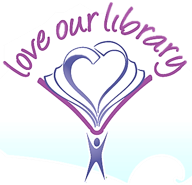 Please remember to log your volunteer hours in Additions! Just signing in at the front office does not log your hours. A Canvas course for SRMS’s Guidance Department is now available! We are happy to announce that the Guidance Department at SunRidge Middle School is launching a Canvas Course for students and parents. Please visit the course for information about Florida Virtual School courses, Eagle’s Landing presentations, and various parent resources. The course name is SunRidge Guidance 18-19. We need help with decorations, ticket sales, refreshments, and a photo booth. Any help you can give will be greatly appreciated!!. If you want to be part of the planning committee please email Nicole Wilson at ncwilson5@gmail.com. It's going to be a BLAST!! Tickets are going on sale tomorrow, April 8th during 8th Grade Lunch. Students must have a signed contract and their school ID to purchase a ticket. Contracts can be picked up from the front office or printed- 8th Grade Dance Contract.pdf . Tickets are $10 per person. Come celebrate and say “Sea You Later” to Middle School on Friday, April 26th from 6:00 - 8:00 pm. 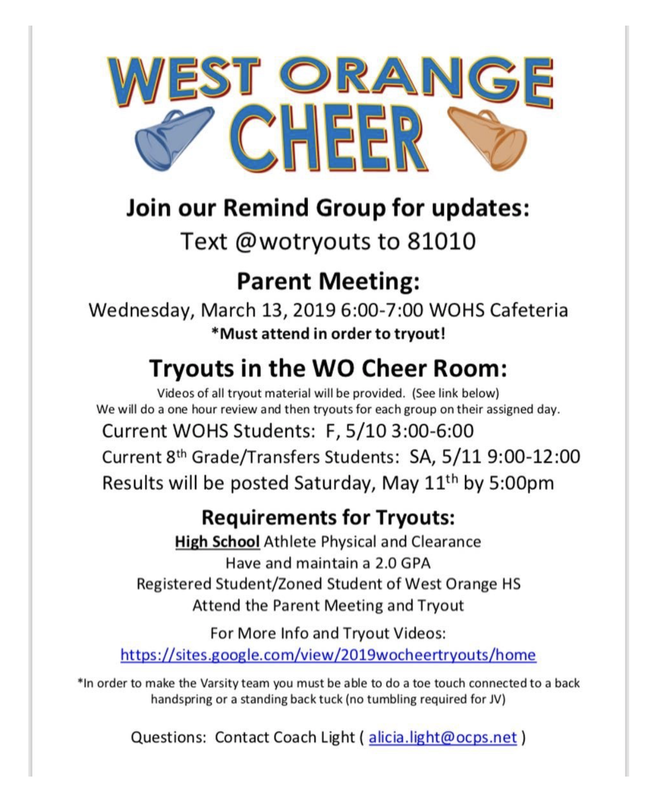 Parents of next year's incoming freshman to West Orange High School are invited to a "Meet & Greet" with the Board Members of the West Orange High School PTSO. This a perfect chance for you to come to introduce yourselves and take the opportunity to get to know us and how you can become involved. The “Meet & Greet" will take place at the Crooked Can in downtown Winter Garden on Thursday, April 18th from 6:30 pm - 8 pm. We look forward to seeing you there! June 3-6 and June 10-13 from 9:00am-1:00pm at West Orange High School. After-care is available until 4 pm for an additional charge. All students entering grades 1-8 in the 2019-2020 school year! The West Orange Summer Music Camp is a two-week camp offering comprehensive music education by professional music educators and musicians in a fun, exciting, and positive environment for students entering grades 1-8. Students entering grades 1-3 will participate in the Elementary Music Camp where they will receive instruction from certified elementary music educators in the areas of Orff, keyboards, singing, percussion, movement, dance and so much more! Students entering grades 4-8 will participate in Band Camp, regardless of prior music experience. Beginners will be provided with an instrument and all other students are expected to provide their own instrument (please inquire if you have an instrument concern). All students in Band Camp will receive individual, small group and large ensemble instruction, including full band, jazz bands, and chamber ensembles. Students with no prior experience will start in beginning band. They will learn about and try all the different band instruments before selecting an instrument to learn at camp. Instruments available to learn at camp include: Flute, Clarinet, Saxophone, Trumpet, French Horn, Trombone, Euphonium, Tuba and Percussion. Students in beginning band will perform at the end of camp concert on Thursday, June 13 at 6 pm. Students entering 7th grade will participate in 7th-grade band and Camp Band. Students entering 8th grade will participate in 8th-grade band and Camp Band. These students will also get to elect to perform with a jazz band or a chamber ensemble. All these students will be reviewing concepts they learned in 6th and/or 7th grade, including, scales, technique, tone, balance, blend, and musicianship. All students will perform in the camp concert on Thursday, June 13th at 6 pm. The fee is $180 for the eight days of the West Orange Summer Music Camp. Lunch will be available for separate purchase at camp. After-care is available for an additional $50 for the eight days (or $10 a day for individual days) and can be paid at camp check-in on June 3rd. Please visit www.westorangeband.com and click Summer Camp to register online. The fees can be paid by following the link to Schoolpay. If you would prefer to pay by cash, check or money order, set up a payment plan or request financial assistance, please contact West Orange High School Band Director and Camp Director, Ken Boyd at kenneth.boyd@ocps.net. Don’t wait, please register today for this incredible experience! Registrations are due by May 10th. 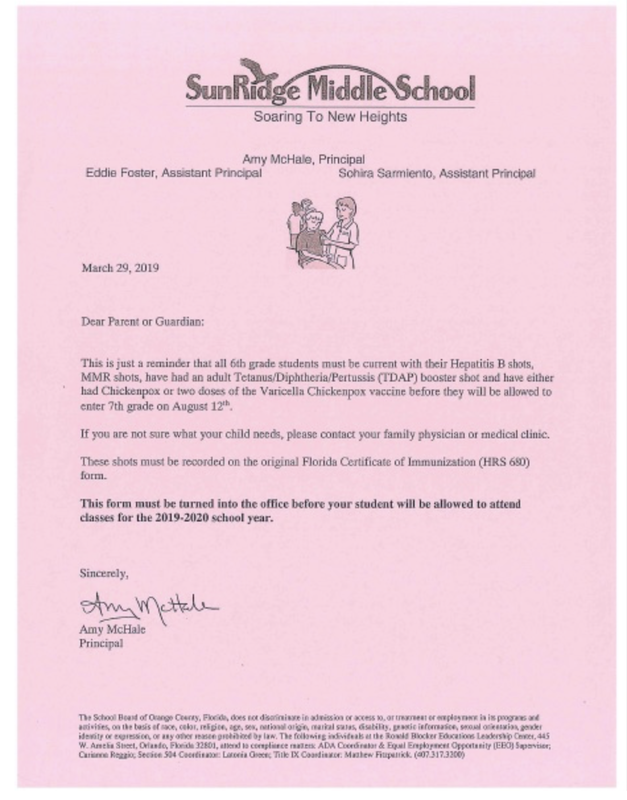 This is just a reminder that all 6th grade students must be current with their Hepatitis B shots, MMR shots, have had an adult Tetanus/Diphtheria/Pertussis (TDAP) booster shot and have either had Chickenpox or two doses of the Varicella Chickenpox vaccine before they will be allowed to enter 7th grade on August 12th. If you are not sure what your child needs, please contact your family physician or medical clinic. These shots must be recorded on the original Florida Certificate of Immunization (HRS 680) form. This form must be turned into the office before your student will be allowed to attend classes for the 2019-2020 school year. Please see a copy of the form that was sent home with students on Monday, April 1, 2019. Complete the attached order form and it will be sent to their 7th-period class. Next date the store will be open before school is March 6, 2019! If you have any questions, please email spriritwear@srmsptso.org. HEADPHONES/EARBUDS REQUIRED FOR FSA – ELA READING: 7thand 8thgrade students should bring their own headphones or earbuds for the FSA ELA Reading assessment. We have a limited number of headphones for student use on campus. Students may purchase earbuds in the media center for $1.00. Wireless headphones/earbuds are not allowed during testing. RECEIVING A FSA – ELA SCORE: Students must take the FSA ELA Writing component and FSA ELS Reading components to receive and FSA ELA score. MAKEUPS: This schedule is tentative and is subject to change at any time. 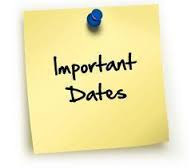 Make-up sessions will be held throughout the testing window and students who are absent for an original date of testing should expect to be pulled for a make-up session immediately upon their return to school. *Paper based assessments (PBT):are paper pencil assessment. *Computer-based assessments (CBT): students take the assessments on their assigned OCPS laptops or on an OCPS computer provided to them for the day of testing. Please make sure that your student charges their laptop nightly. Love Science? 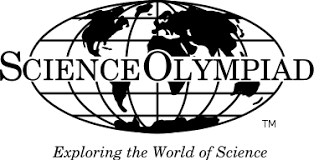 Join our ScienceOlympad Team! 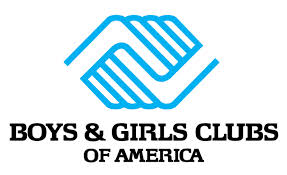 See Mrs. Colwell, Mrs. Dabiesingh or Mrs. Ramos for a boys and Girls Club application. We meet every Monday, Tuesday & Wednesday 4:00-5:30 pm. Need help with computer programs like Canvas and Progressbook? Have something on the programs you need just a little more help with? We are here for you! Mrs. Nelms is now scheduling digital parent conferences to get one on one help with understanding the computer programs. She will be available select mornings or other agreed upon times. 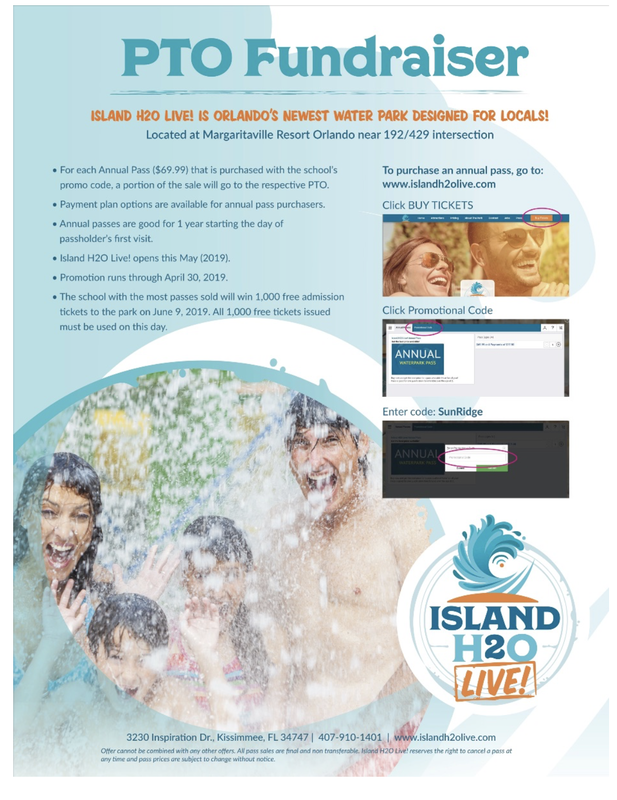 Email robin.nelms@ocps.net to schedule your appointment today! Students must receive a pass from their teacher for morning tutoring to gain access. This is crucial since teachers are rotating who is doing tutoring and it is not always in the same location. 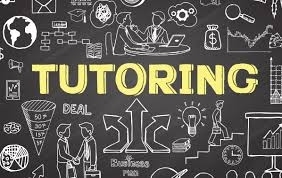 For Pre-Algebra, Civics, and 7th grade Science tutoring, please contact your child’s teacher. Writing Club has begun! Students meet in room 519 every Thursday, from 8:45am to 9:15am. In Writing Club, students focus on building their skills in creative writing, working with short stories, poetry, and creative nonfiction. They will also enter contests and publish their work in the first-ever SRMS literary magazine – stay tuned! Questions may be addressed to Corey Lorini (corey.lorini@ocps.net) and John Yourick (john.yourick@ocps.net). We welcome all students to join the chess club! No experience required; we will teach any student how to play, and we offer extended learning for intermediate and veteran players. All chess club students must register for Boys and Girls Club, which is free; registration forms are available in the front office. Chess Club meets every Thursday after school until 5:15 pm. At dismissal, chess club students should report to the cafeteria. We’re also to excited to announce that this year’s OCPS Middle School Chess Tournament will be hosted by SunRidge Middle! The tournament will take place on Saturday, March 30, 2019. Join the chess club today and mark your calendars! More details to come. Please contact Mr. Yourick with any questions (john.yourick@ocps.net). 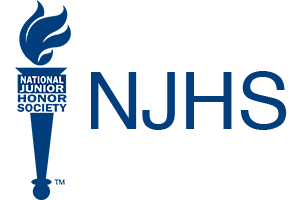 NJHS meetings will be held the first Wednesday of every month (except January) at 8:35 AM in the cafeteria. Meetings are mandatory for 7th and 8th-grade members. 6th-grade students will be invited during the 4th quarter, and should not be attending meetings until then. 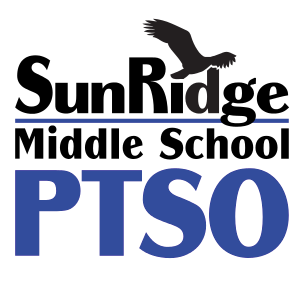 There are so many ways for students to get involved at SunRidge Middle School. Here is a list of all of the Clubs available! *Membership to Boys & Girls Club is required. It is free to join! Applications are available in the main office. Boys & Girls Club of Central Florida offer FREE after-school zone care for our students at SunRidge MS! 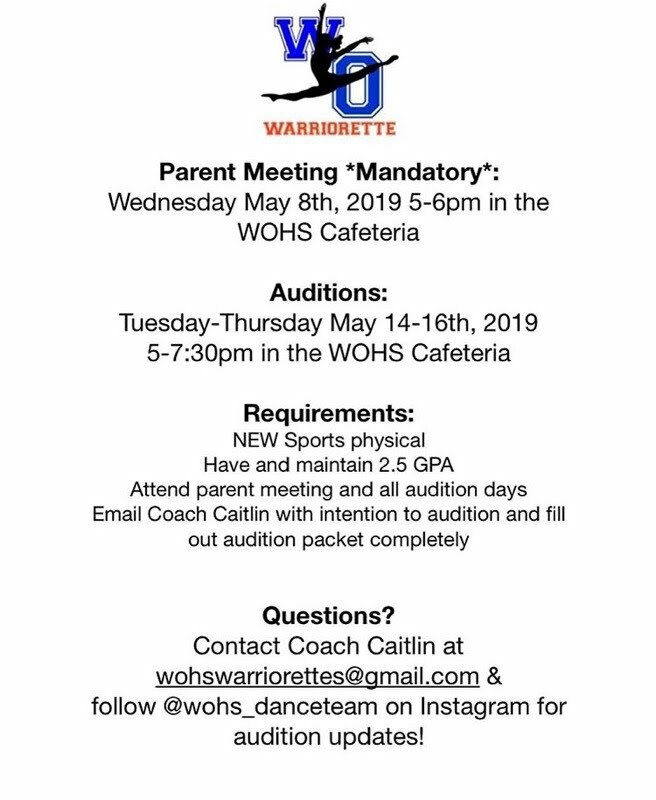 If you are interested in registering your child, please complete a paper application located in the front office, or with any of the guidance counselors. The hours are dismissal until 6:00pm. There will be a late charge assessed for consistently late pick-ups. 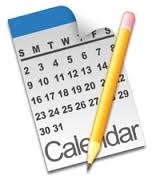 Click here to view the September Calendar! Naviance is a computer-based program that provides students with a variety of features, including course planning, career assessments, personality tests, and personal interest surveys. The goal of the program is to help students connect what they are doing in school to what they would like to do once they complete their education. The SRMS Guidance Department met with 6th, 7th and 8th-grade students through Social Studies classes the week of October 8 – 12, 2018. Students have the opportunity to complete a "Career Cluster Survey" and explore videos about various careers of their choice. Please encourage your child to share the results of their survey with you. Many students were surprised by the outcome! To access Naviance, please visit: www.launch.ocps.net. Happy Exploring! EBLAST REGISTRATION: Be in the know with the important dates, events and activities happening at SunRidge! Please click here to sign up to receive the EBLAST weekly newsletter. 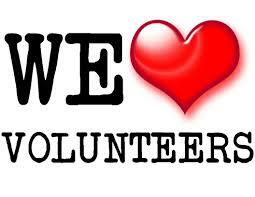 We are asking all SRMS volunteers to please log in your volunteer hours ASAP. You can put in bulk hours if needed. In order to stay a 5 Star School, we must meet the required amount of volunteer hours. Thank you for all the time you have given SRMS and making a difference! Please click the HERE to log into the ADDitions site. With the frequency of afternoon storms this time of year please familiarize yourself with OCPS's 30-30 Rule below. There are many volunteer opportunities here at SRMS! If you are looking to get involved please go to http://signup.com/go/DaoLtG and see the many different teacher, school and PTSO activities available. We appreciate all of our volunteers as they help to make our school a success! Help us with your Online Shopping? AmazonSmile is a website operated by Amazon with the same products, prices, and shopping features as Amazon.com. The difference is that when you shop on smile.amazon.com, the AmazonSmile Foundation will donate 0.5% of the purchase price of eligible products to the charitable organization of your choice. 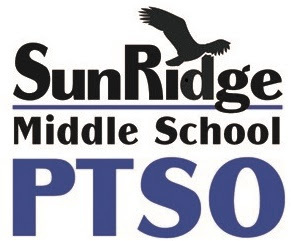 Please select Sunridge Middle School PTSO to help benefit our many programs here for our students during the year. It is amazing how quickly the purchases add up! Thank you! Keep up to date with SRMS PTSO on Facebook. Keep up to date with SRMS on Facebook. Remind is a simple way for you to stay informed and up-to-date with what’s happening. By joining the SRMS PTSO on Remind, you’re choosing to receive messages via push notifications, SMS, or email. Don’t worry, your phone number will not be shared with anyone else. Pursuing worthy objectives with determination and patience while exhibiting fortitude when confronted with failure. Activity maintained in spite of difficulties. We're off to a great start for the new school year, but it could be even better with YOUR help!! 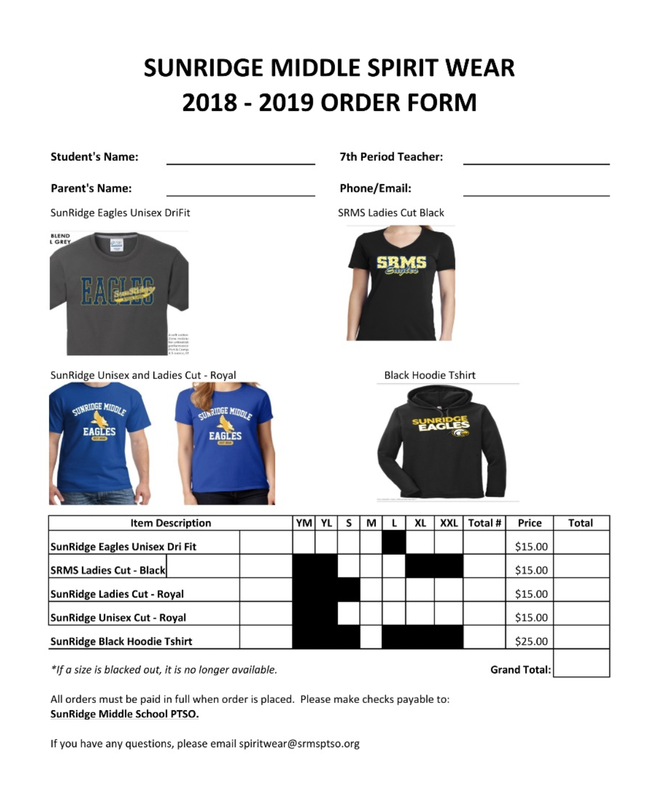 Sign up to be a part of your SunRidge Middle School Parent, Teacher and Student Organization now! If you would like to order any spirit wear please use this order form and send to the office. When filled, orders will be given to students' 7th-period teachers for distribution. If you have any questions, please email spriritwear@srmsptso.org. There are many great ways to Plug Into what is happening at SRMS. Please visit our Communications webpage to find out how. 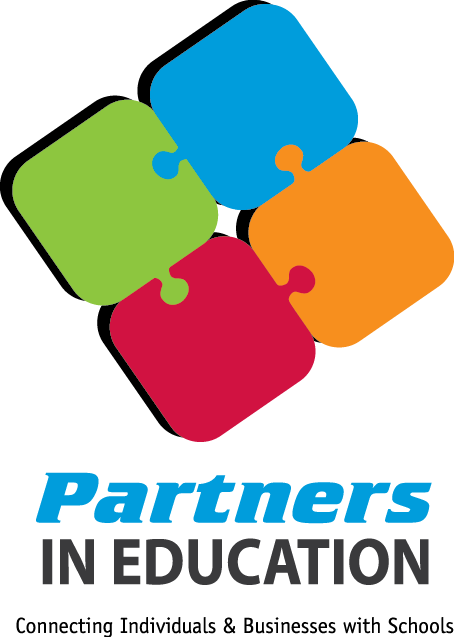 Visit our Partners in Education page for a full listing of all PIE partners.